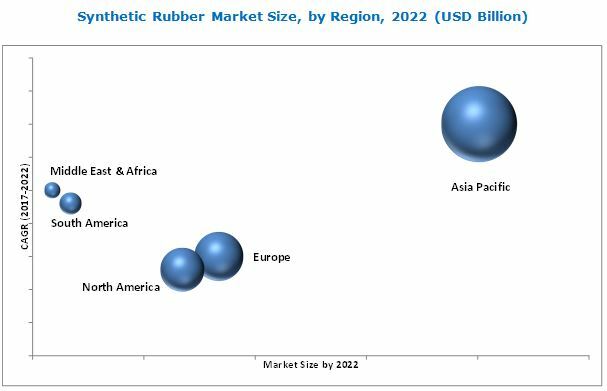 [155 Pages Report] Synthetic Rubber Market size was valued at USD 27.27 Billion in 2016 and is projected to reach USD 37.82 Billion by 2022, at a CAGR of 5.5% between 2017 and 2022. The base year considered for the study is 2016, while the forecast period is from 2017 to 2022. To define, describe, and forecast the global synthetic rubber market size on the basis of type, application, and region. To analyze the opportunities in the market for stakeholders and details of a competitive landscape for market leaders. To forecast the market size, in terms of volume and value, with respect to five main regions, namely, North America, Europe, Asia Pacific, South America, and Middle East & Africa. To track and analyze the competitive developments, such as joint ventures, mergers & acquisitions, new product developments, and research & development (R&D) in the global synthetic rubber market. A top-down approach has been used to estimate and validate the size of the synthetic rubber market and to estimate the sizes of various other dependent submarkets in the overall synthetic rubber market. The research study involved the extensive use of secondary sources, directories, and databases, such as Hoovers, Bloomberg, Chemical Weekly, Factiva, and other government and private websites to identify and collect information useful for the technical, market-oriented, and commercial study of the synthetic rubber market. The supply chain of the synthetic rubber market starts with the sourcing of raw materials, followed by the manufacturing and processing of synthetic rubber, and the supplying of finished synthetic rubber products. It ends with the use of synthetic rubber in the various end-use applications. The major players in the synthetic rubber market include LANXESS (Germany), Sinopec (China), The Goodyear Tire and Rubber Company (US), Kumho Petrochemical (South Korea), TSRC Corporation (Taiwan), Nizhnekamskneftekhim (Russia), JSR Corporation (Japan), LG Chem (South Korea), Versalis S.p.A. (Italy), and ZEON Corporation (Japan). This research report categorizes the synthetic rubber market on the basis of type, application, and region. The synthetic rubber market is estimated to be USD 28.88 Billion in 2017 and is projected to reach USD 37.82 Billion by 2022, registering a CAGR of 5.5% between 2017 and 2022. Rising use of synthetic rubbers in the tire and non-tire automotive applications, growing trend of using synthetic rubbers in automotive to reduce the weight of vehicles for fuel efficiency, and increasing demand from Asia Pacific are the major factors expected to drive the global synthetic rubber market during the forecast period. The synthetic rubber market is segmented based on type into SBR, BR, SBC, EPDM, IIR, and NBR. SBR (styrene butadiene rubber) is the most widely used type of synthetic rubber and is used in large quantities in automobile and truck tires, due to its abrasion-resistant quality. SBR produced in latex form is used as a rubbery adhesive in carpet manufacturing. Other applications of SBR include drive couplings, haul-off pads, conveyor belts, shoe soles and heels, adhesives, roll coverings and car tires (but not truck tires), and various other molded rubber goods. Based on application, the synthetic rubber market is classified into four segments, namely, tire, non-tire automotive, footwear, and industrial. The tire segment is estimated to be the largest application segment of the synthetic rubber market. Synthetic rubber offers various extraordinary features to tires, such as safety, control, grip, and comfort. It also provides various other features, such as directional stability, rolling resistance, wet traction, puncture resistance, steering response, speed and run-flat capability, impact resistance, high fuel efficiency, and weather resistance to function in challenging conditions. The increasing demand for tires offering smoother and quieter ride with better fuel efficiency has compelled tire manufacturers to use better materials, such as synthetic rubber and silane. Synthetic tires are widely used in military vehicles and heavy-duty vehicles. Asia Pacific is estimated to be the largest market for synthetic rubber in 2017 and is also projected to register the highest CAGR during the forecast period. China is expected to account for the largest share of the Asia Pacific synthetic rubber market till 2022 and is also expected to be the fastest-growing market for synthetic rubber during the forecast period. Major producers of synthetic rubber, such as Sinopec (China), Kumho Petrochemical (South Korea), TSRC Corporation (Taiwan), JSR Corporation (Japan), LG Chem (South Korea), and ZEON Corporation (Japan) are located in the Asia Pacific region. Europe is estimated to account for the second-largest share of the global synthetic rubber market. The key players in the synthetic rubber market include LANXESS (Germany), Sinopec (China), The Goodyear Tire and Rubber Company (US), Kumho Petrochemical (South Korea), TSRC Corporation (Taiwan), Nizhnekamskneftekhim (Russia), JSR Corporation (Japan), LG Chem (South Korea), Versalis S.p.A. (Italy), and ZEON Corporation (Japan). These companies have majorly adopted the expansion strategy to increase their market share and cater to the increasing demand for synthetic rubber products. For example, in 2013, LANXESS opened a new butyl rubber plant on Jurong Island, Singapore. The company invested USD 531.7 million in the plant, which has a capacity of 100,000 metric tons. Through this expansion, the company aims to serve the growing demand for synthetic rubbers in Asia. 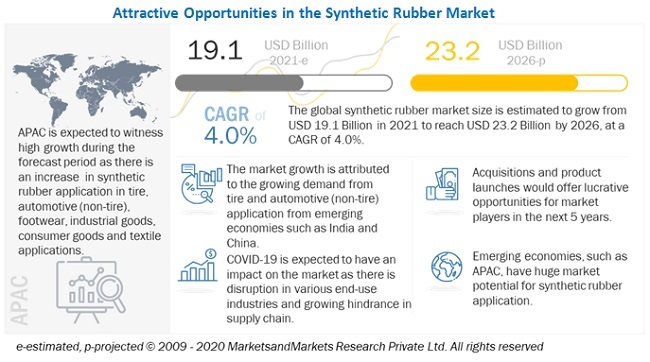 Apart from expansion, the market players have also adopted new product development and agreement strategies to expand their market share and product portfolio in the synthetic rubber market between 2014 and 2017.